Ridley Scott directed this epic-scale historical drama inspired by the events of the Crusades of the 12th century. Balian (Orlando Bloom) is a humble French blacksmith who is searching for a reason to go on after the death of his wife and children. Balian is approached by Godfrey of Ibelin (Liam Neeson), a fabled knight who has briefly returned home after serving in the East. Godfrey informs Balian that he is his true father, and urges the blacksmith to join him as he and his forces journey to Jerusalem to help defend the holy city. 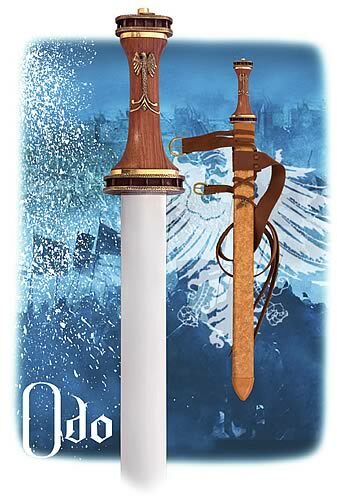 Balian accepts, and he and Godfrey arrive during the lull between the Second and Third Crusades, in which the city is enjoying a fragile peace. Both Christian and Muslim forces are temporarily in retreat, thanks to the wisdom of the ChristianKingdom of Heaven 3 monarch King Baldwin IV (Edward Norton), his second-in-command Tiberias (Jeremy Irons), and Muslim potentate Saladin (Ghassan Massoud). Violent agitators on both sides are foolishly eager to end the peace in a bid for greater power, and Saladin bows to pressures from Muslim factions; Godfrey is one of a handful of brave knights who has thrown his allegiance behind Baldwin IV and his community of diversity, and Balian joins him as they use their skills as warriors in a bid to build a lasting peace. 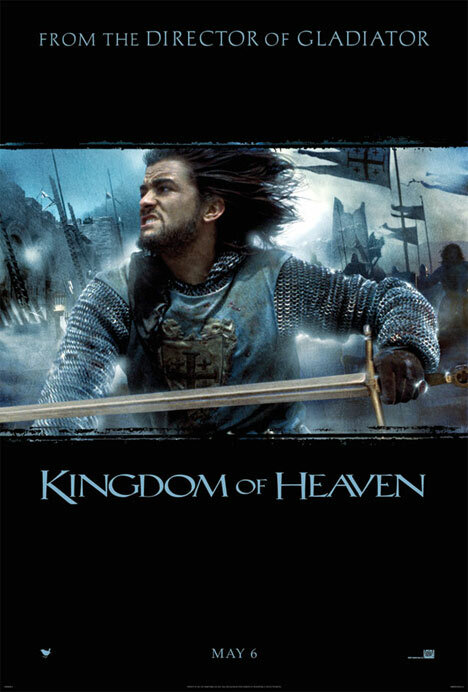 Kingdom of Heaven also stars Eva Green as the princess Sibylla, David Thewlis as Hospitaler the priest, and Brendan Gleeson as Reynald. 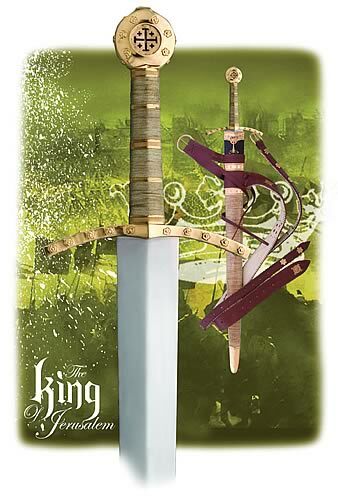 Kingdom of Heaven Movie Prop Peplicas, Figures, Toys and Collectibles! This one-handed cruciform sword has classic brass wheel pommel and tapered guard. The one-hand grip is wood wrapped in steel wire. Blade is well-tempered high carbon steel and is well-balanced for powerful blows. Includes wall plaque and certificate of authenticity. Made by Windlass Steelcrafts. Hand forged high carbon steel blade, with pommel and crossguard plated in a rich sterling silver. The most unique aspect of this piece, the translucent red cross imbedded in the pommel has been expertly replicated from the movie prop. Hardwood grip with both leather and brass wire accents. Made by Windlass Steelcrafts. Includes matching wall plaque and certificate of authenticity. This stunning Viking type sword is adorned with a Germanic brass eagle embedded into the heavy wooden grip, while the pommel and guard are of antique brass. Hand forged high carbon steel blade. Includes matching wall plaque and certificate of authenticity. This Saracen blade is hand forged of high carbon steel, while the pommel and crossguard are plated in a rich 24K gold. Even the most unique aspect of this piece, the forked tongue blade, has been expertly reproduced. 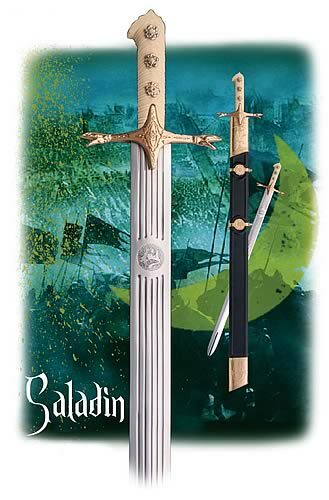 Every effort has been made by the master craftsmen at Windlass Steelcrafts to ensure that the Sword of Saladin matches the movie blade in every way. A decorative wooden wall mountable display plaque and certificate of authenticity is included. 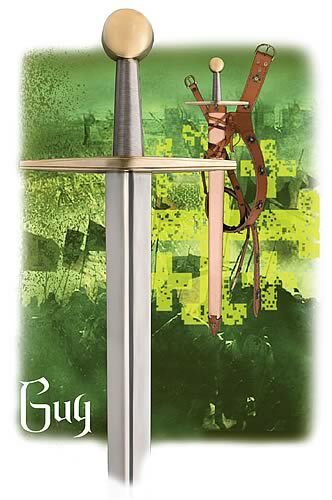 This beautiful war sword has gleaming brass parts with small raised flowers and the pommel has a clear-thru cut out of the Jerusalem Cross. The two-handed grip is wrapped in rawhide lacing for a good hold and has decorative brass rings spaced over it's full length. 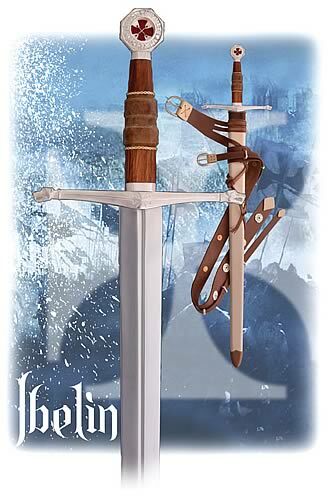 The wide, well-tempered high carbon steel blade is slightly hollow ground to make this a fast and deadly sword. Includes wall plaque and certificate of authenticity. Officially endorsed by the Roman Catholic Church around 1129, the Order became a favoured charity throughout Christendom and grew rapidly in membership and power. Templar knights, in their distinctive white mantles with a red cross, were among the most skilled fighting units of the Crusades. Non-combatant members of the Order managed a large economic infrastructure throughout Christendom innovating financial techniques that were an early form of banking and building fortifications across Europe and the Holy Land. The Templars' existence was tied closely to the Crusades; when the Holy Land was lost, support for the Order faded. Rumours about the Templars' secret initiation ceremony created distrust, and King Philip IV of France, deeply in debt to the Order, took advantage of the situation. In 1307, many of the Order's members in France were arrested, tortured into giving false confessions, and then burned at the stake. Under pressure from King Philip, Pope Clement V disbanded the Order in 1312.
known as Ṣalāḥ ad-Dīn Yūsuf ibn Ayyūb in Arabic and Selahedînê Eyûbî in Kurdish, was the first sultan of Egypt and Syria and the founder of their Ayyubid dynasty, although it was named after his father. A Muslim of Kurdish origin, Saladin led the Muslim opposition to the European Crusaders in the Levant. At the height of his power, his sultanate included Egypt, Syria, Mesopotamia, Hejaz, Yemen and other parts of North Africa.